Whip Resources Guide Whip Cracking Advice Centre. How to crack a whip. Whip Buying Guide. Where to buy a whip, how to crack a whip. A whip cracking resource guide for family friendly sports whip crackers , circus performers and beginners who want to take up this great sport. What you need to know to buy a whip, video tutorials on how to crack a whip, how to maintain a whip, the different types of whip etc. Please contact Pete Gamble on 07875 826773 or email him at ahandfulofhats@gmail.com or just click here to email for further information. 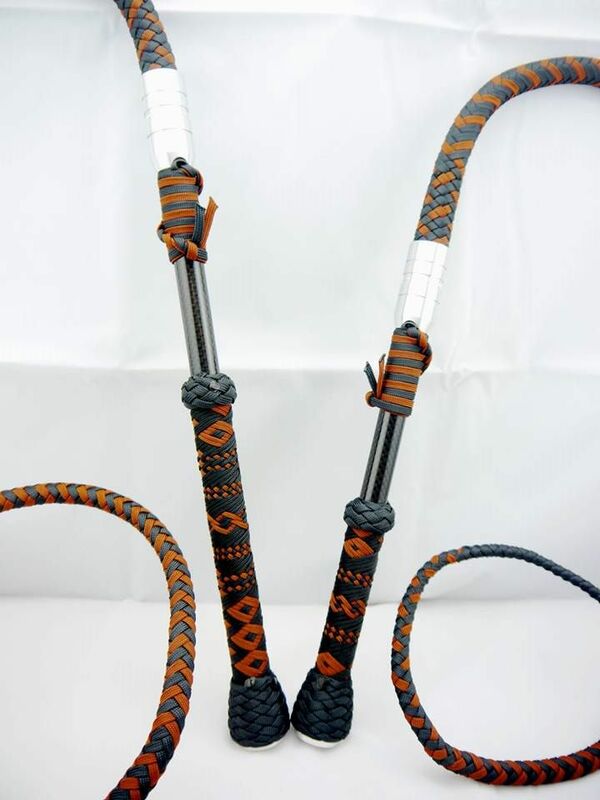 with contact details of whip makers from around the world. Join the Sports, Circus and Performance Whip Crackers Facebook Group. This whip resource guide has grown from a simple list of where to get a tidy whip to a weighty tome! To save you having to wade through it all, just be aware it is in a series of sections, so scroll down to find the bit you are after, I shall add page links once I’ve worked out how to do that .. 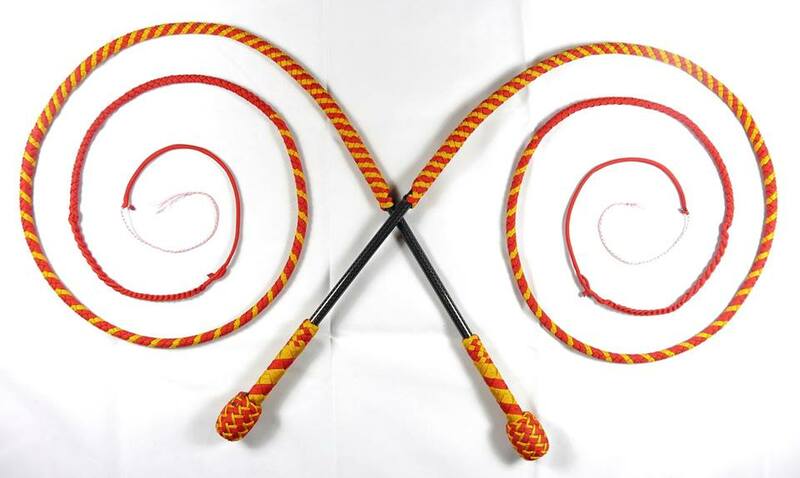 Section Three : Bull whip, Stock whip? Performance Hybrid? 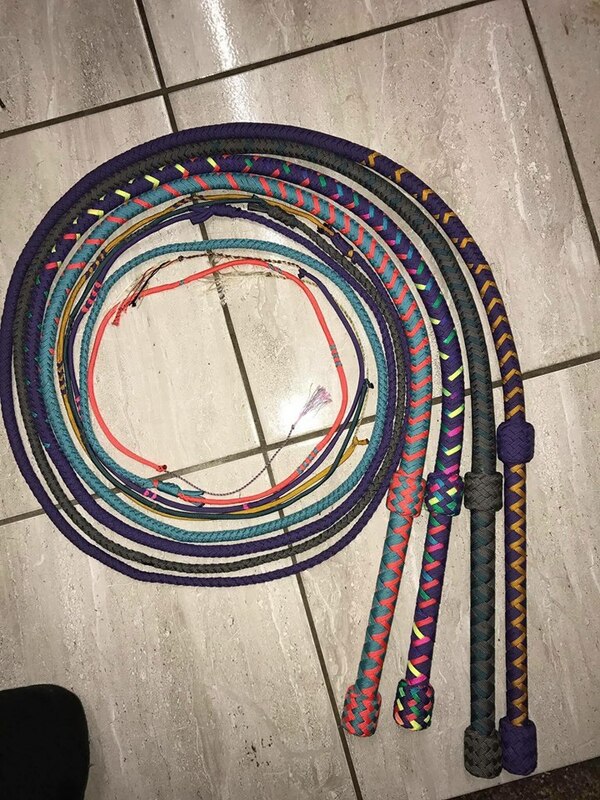 Snake whip / Signal Whips? Which type of whip should I buy? 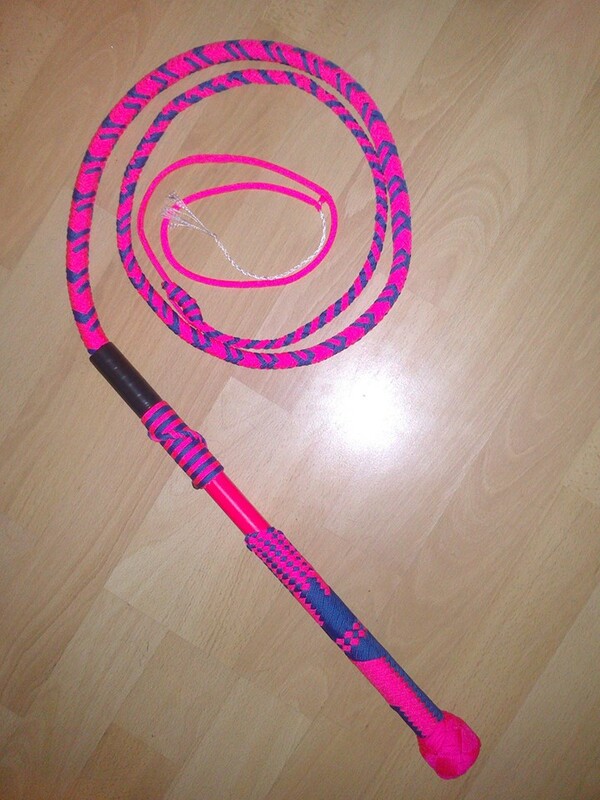 Section Four ; How long a whip should I buy? Section Five: What to look for in a whip. Section Six: Where to buy and what to pay. The Loaner Whip Package. Section seven : Whip cracking safety. Section Eight: The Whip Makers Guide. Section Nine: How to crack a whip and a whip maintenance guide. It was, in hindsight, pretty terrible, but it was the only type available in juggling shops 25 years ago, with a poor whip and no technique it took three months to finally make it crack, but he can now teach people how to crack a whip in three minutes, give him half an hour and he'll have you performing stunts and tricks . 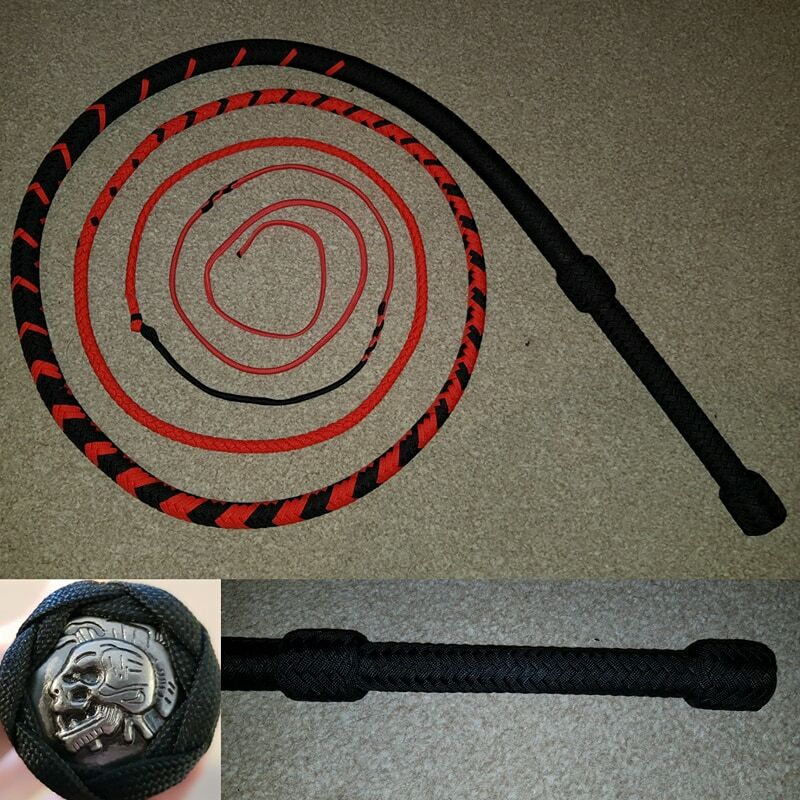 Having taught thousands of people in workshops all over the UK and Europe, he got increasingly frustrated at the rubbish that some sellers and websites still try to foist onto the unsuspecting beginner, even if they say have made whips used in a famous film. ...avoid so called "money back guarantees !! (you only get your money back if the whip is never usedat all, crack it once and they will refuse to replace it!! There is a list of whip makers lower down the page that Peter has actually bought, owned and used in shows, training and workshops plus some others who’s reputation is beyond reproach. If you see a whip elswhere that you fancy, whether it’s from Ebay or a website save yourself some grief and send Pete the link for a an opinion, if he doesn’t know what they are like, he’ll know someone who does. Please accept these scribbles as a guide. Peter is no whip maker, he leaves that to the skilled individuals listed later on, but having owned hundreds of whips from many different makers, and having been trained by three world champions and cracked whips professionally for over 25 years all over the world he’s won International and National whip cracking championships and being honoured as the only Western Arts Club, " Master Whip Trainer", he knows a good whip when he handles one. However, he won't be held responsible for any of the whips you may buy or the customer service you receive from the suppliers noted as it is offered in good faith however if you reckon you have been sold a dud, he'll have a look at it for you. The advice offered is in good faith. "caveat emptor et volunti non fit injura!" Buyer beware and you participate in the sport at your own risk. 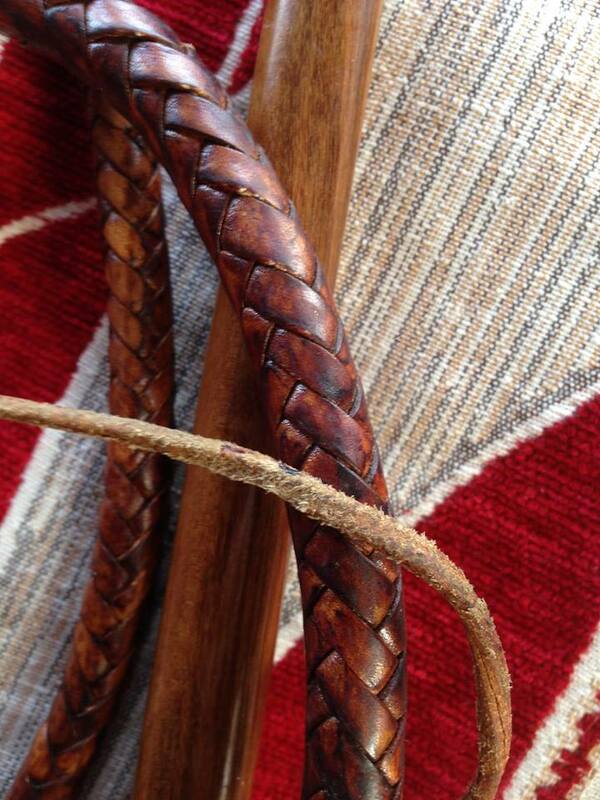 A selection of beautiful, world class , award winning kangaroo hide whips by Peter Thorndike from Australia . 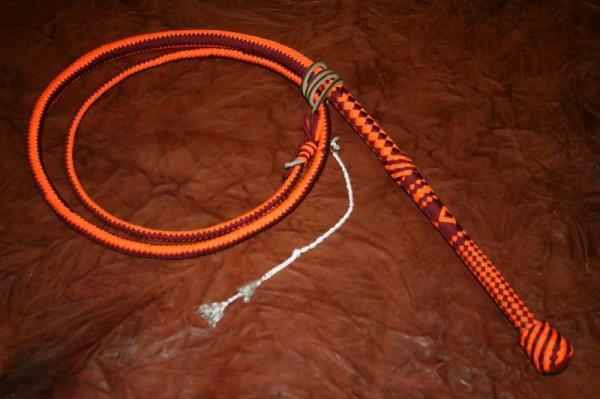 If you say the word whip, most people think of a bull whip and generally if they want to learn how to crack a whip they go out and buy the longest one they can afford from Ebay or an outdoor activity website .... big mistake ! most that are available from places like that, are only good as wall hangers. 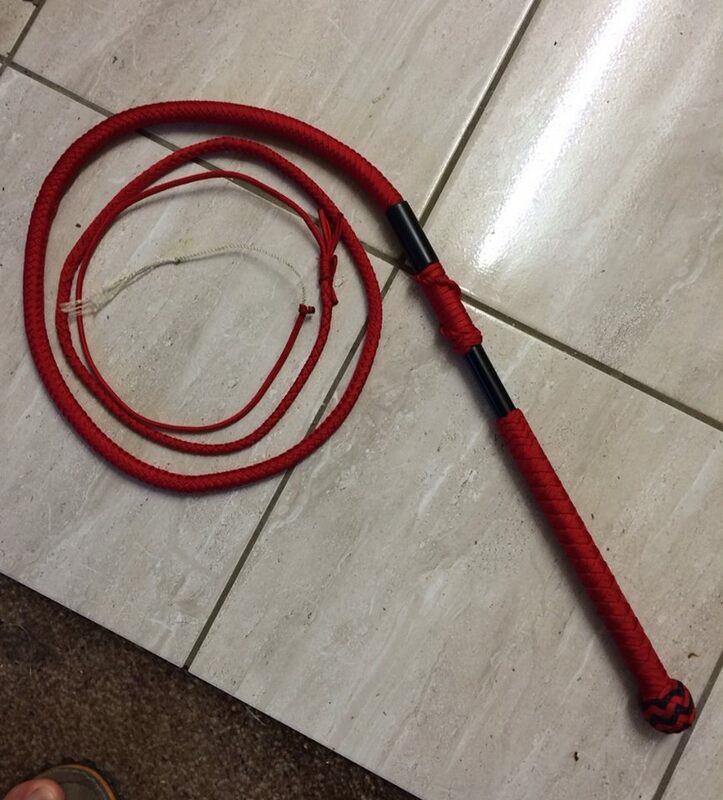 The cheapest nylon bullwhip that almost works, will cost ( 2018 prices ) is £85 plus p&p, it’s a 1.5 metre machine made nylon Karaka whip from House of Poi, but it is like a wet noodle and you can make your own that cracks so much better for less than £15 or get a handmade nylon whip from a UK maker from £80- £150 that will work so much better, so please read on and learn more..
Bull whips, Target Whips, Stock whips, Snake whips, Performance Hybrid (PH) whips, are just some of the many different types of whip available and they all differ in terms of the amount of leverage and mass they offer, some are easier to crack than others and for a beginner I recommend either a Performance Hybrid whip or a long handled bull whip, known these days as a Target whip. 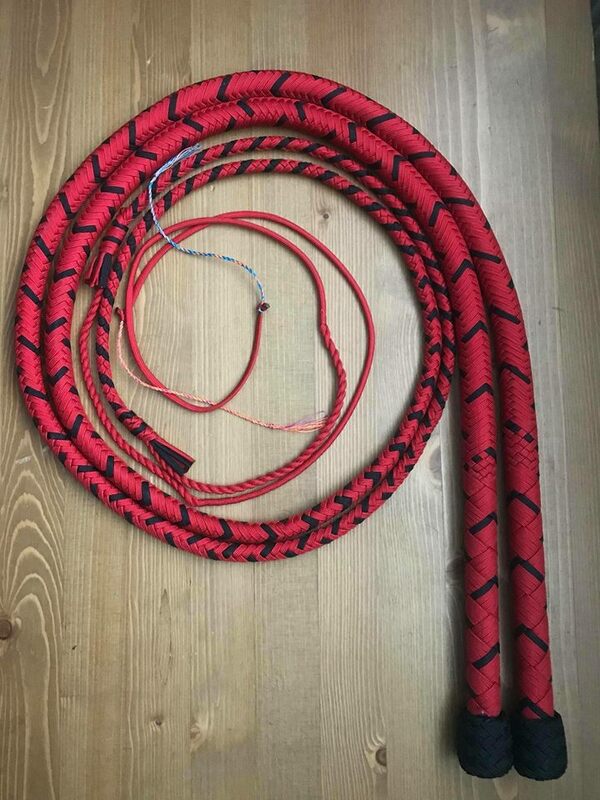 Which type and length of whip should I buy? Which one to go for will depend on your budget and what you want to do with it. 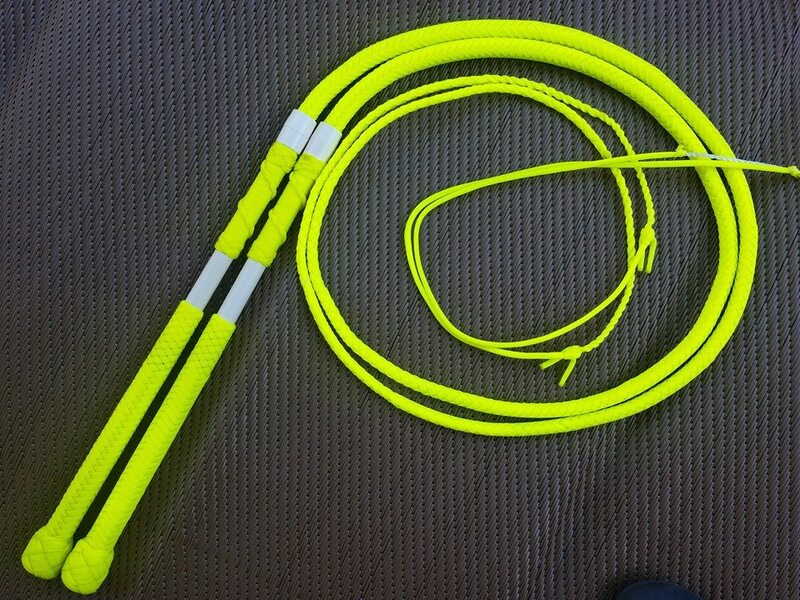 If you want to do multiple fast cracking routines, then a shortish ( 4 1/2 foot) nylon stock whip or Performance Hybrid whips are great, if you want to do fancy two handed routines like Hassets Four Corners then a matched pair of 6ft stockwhips is good, if you want to do body wraps and target work then a 7ft - 10ft + bullwhip is probably better. 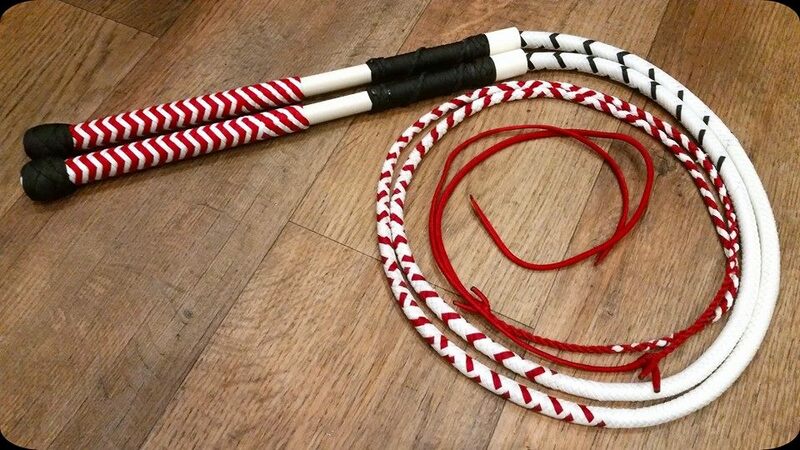 If you are in the UK , a 4 or 5 foot Beginners whip from Mark Bond in Milton Keynes, a budget stockwhip from Rufus Ruffcut or a Tilly and Poppy stockwhip from Scorpion Whips is a great start. 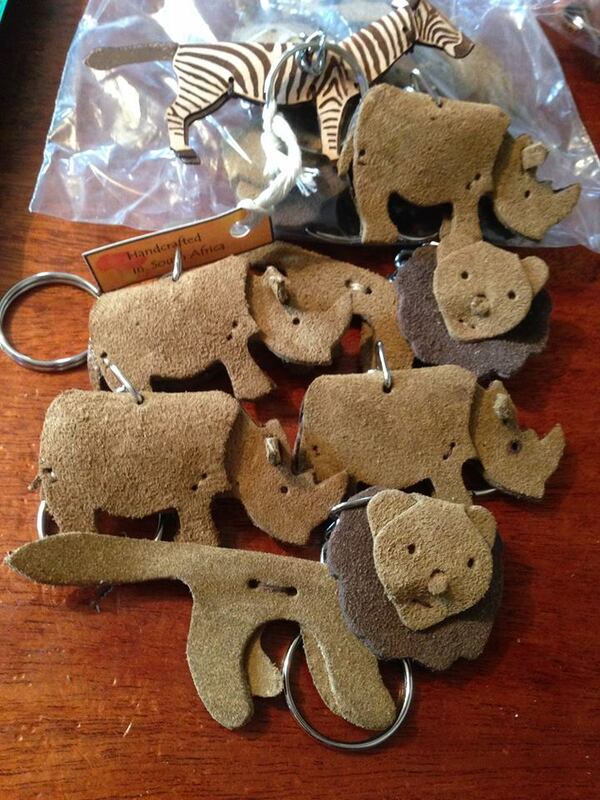 See below for their details and other makers in the US and beyond. 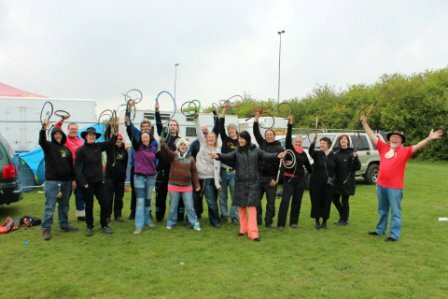 If you want to see the different types of whip in action and one of the finest whip crackers in the world , there are many videos on YouTube of Adam Winrich, he is the 23 times Whip Cracking Guinness World Record holder demonstrating the different types of whip and showing some nifty whip cracking too. I was incredibly fortunate to meet up with Adam when we competed in America at The International Championships in Fort Worth -Dallas,d I went on to win the International Freestyle Performance Whip Cracking Championship , mainly down to me making the audience and judges laugh more than he did I’m sure :-). 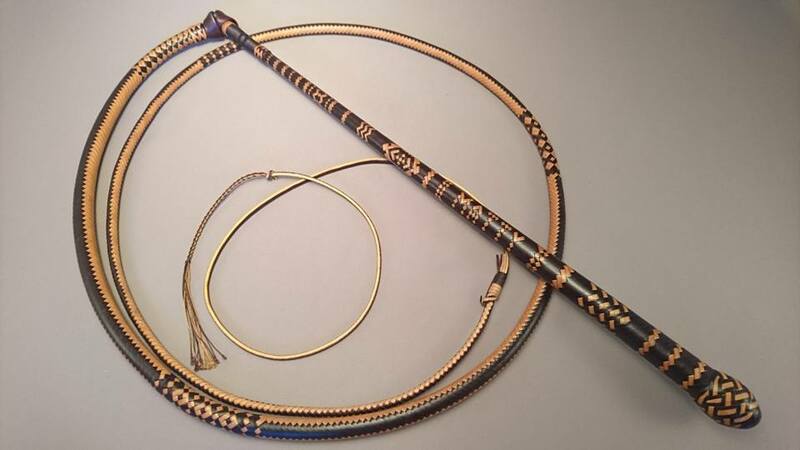 If you want to start with a 6ft Bull whip, BE CAREFUL, some makers commonly include the handle length as part of the braided portion length of the whip and the length of the handle makes a difference on how the whip performs, generally the longer the handle the more accurate it is. 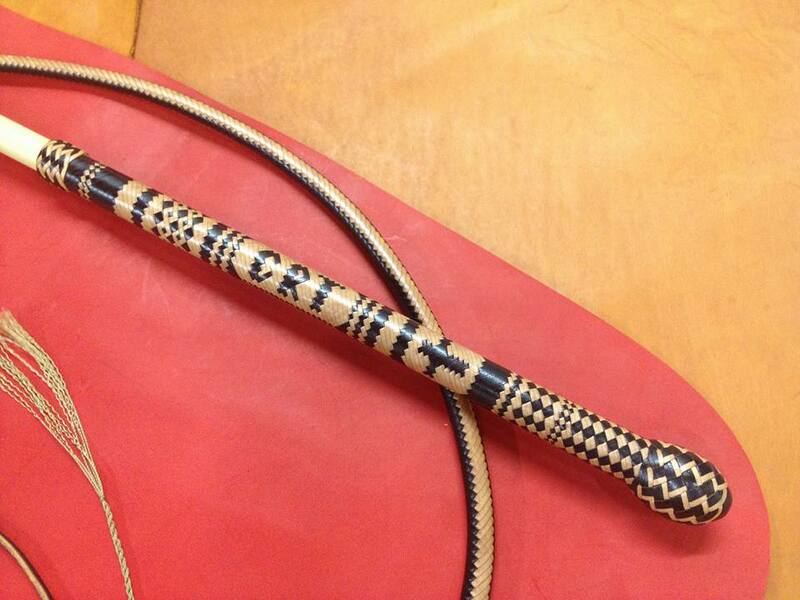 Have a look at this diagram from Rhett Kelley in the States, he doesn't include the length of the handle for his cowhips (they are wooden handled nylon whips where the braid fits into a socket in the end of the handle) but some makers do, the answer is to check before you order. The key phrase is at the bottom of the picture , these are the measurements "commonly used " I've ordered 6ft fire whips but they only were actually only 5ft long with a 12in fall on the end. I've also found makers that included the Fall in the length of their Performance Hybrid whips and still wanted to charge me $25 dollars a foot for it! Just ask the maker " how long is the braid (thong in the US) this is the braided leather or nylon "body" of the whip and how long is the handle? " Ask if the fall is counted in the length or not , see the diagram which sadly does not include PH whips! Traditionally everyone seemed to reccomend that you start with a 6ft bull whip or 5 ft stock whip but if you add the handle length and the "fall" (the bit on the end that wears out) you are now talking of whip that is 8ft+ of whip and that's a long whip for a beginner and you need lots of room and height to play with it. 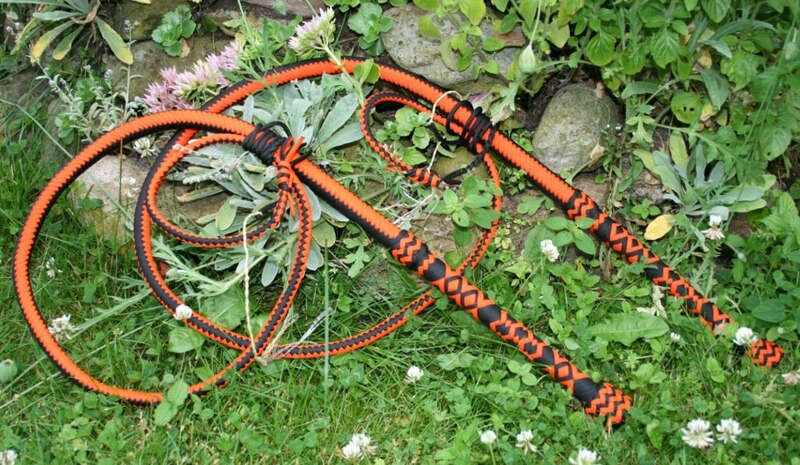 Personally I find a 5 ft bull whip and 4 ft stock or PH whip is a place great start for a beginner, for my whip workshops I've had 3 ft long braided nylon bull whips made they are nearly 5 ft long including the handle and fall and are brilliant to learn basic cracks with. 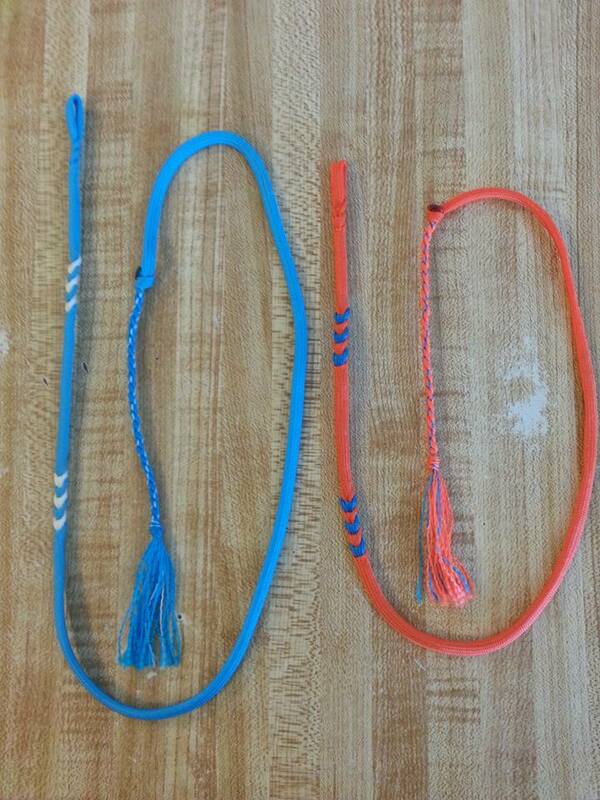 Nylon or Leather whips? what is the best ? All the makers listed in the first section are makers I've bought or used whips from .....I am a professional, family friendly whip performer and look for well made whips that crack easily and accurately. 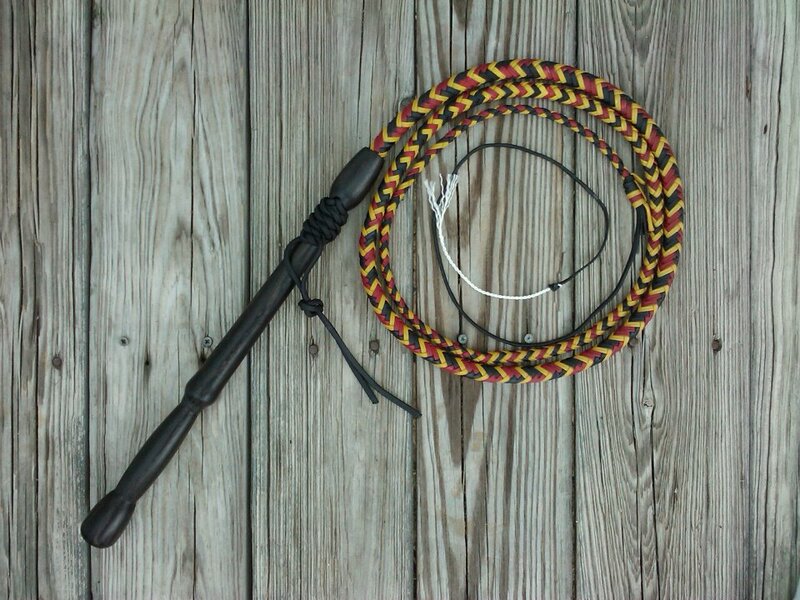 Generally I have found that makers who perform professionally make great whips but there are exceptions to every rule . 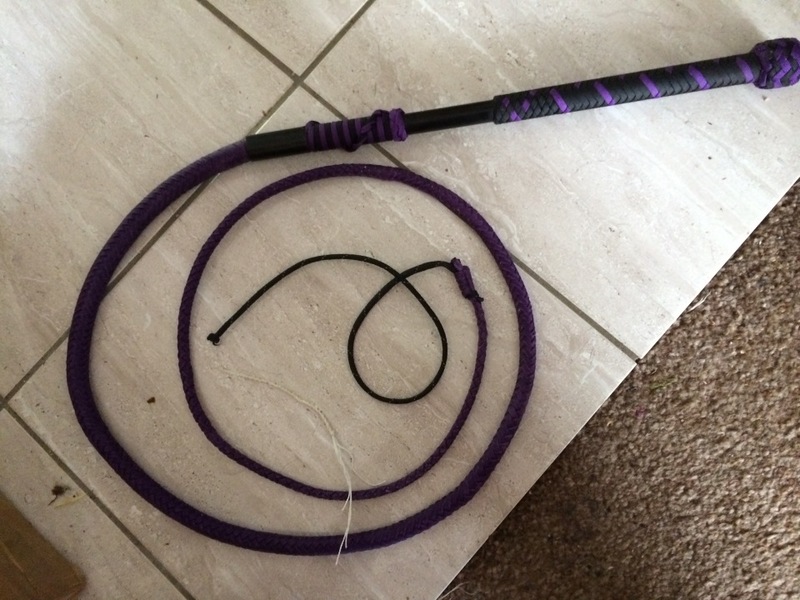 Don't buy a whip from Ebay unless you know the maker or you've dropped me an email and asked my opinion, or from Juggling Shops unless you have had a chance to try them first , ! 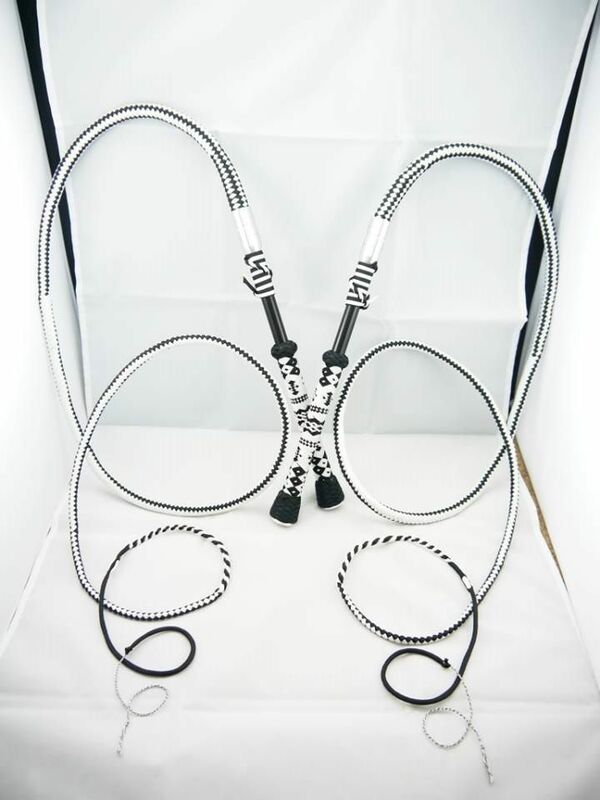 However Western Stage Props now proudly stock Silver Whips from Sylvia Rosat and Midwest Whips from Paul Nolan these are highly rated makers . But note you can buy direct from both at a saving. What should I look for in a whip? Look for good even braiding, if it's patterned then it should be an even pattern all down the length with no obvious twist, it shouldn't be too tight or too loose, when you hold it up and rotate the handle there should be no obvious kinks, twist or bends and it should flow nicely down to the cracker . 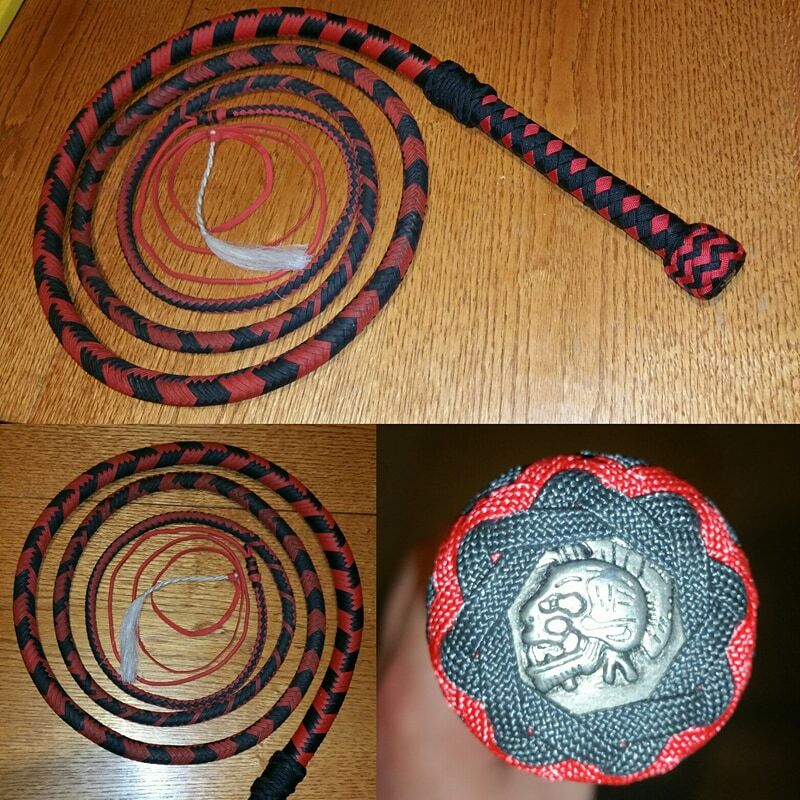 If you have a nylon( paracord) whip, hold the whip horizontally , bring the braid up and loop it so it forms a horseshoe curve with the tail of the whip pointing down and then slowly dip your hand down, the loop should smoothly roll own the length of the whip. New leather whips tend to be stiffer and may need " breaking in" before they do that tho. How many plait or braid should I go for? 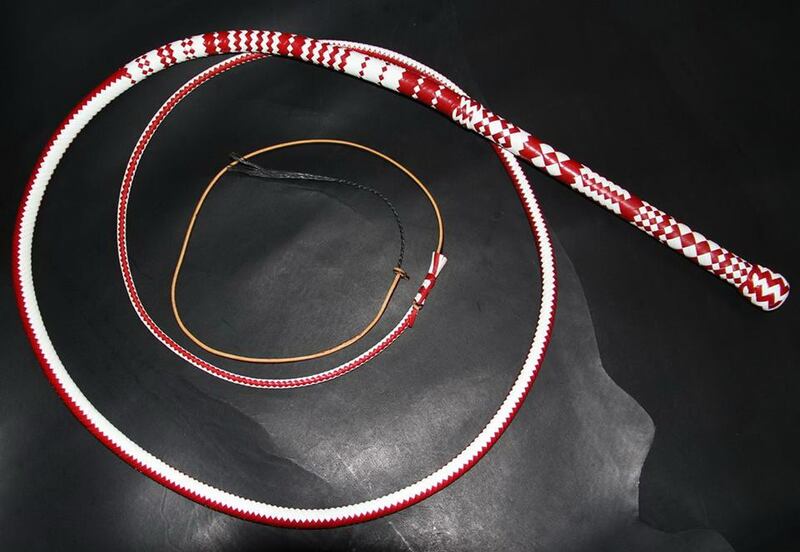 Read the description or ask questions if the details aren't given, for leather whips kanagaroo (roo) hide is the best and the higher the number of plait or strands the better the quality of the whip, 8 and 12 strand are popular with 16, 24 and 32 being top end quality but the higher the plait count, the narrower the braid strand and the easier it is to break them if used roughly. 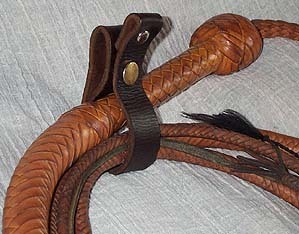 They may have a cut or rolled hide core and then braided over the top in maybe 4 plait to make a belly , then sometimes a leather bolster is laid over it to give it a nice thick shape then braided over the top again, if it's then braided over again before the final braided covering it's called a two bellied whip. 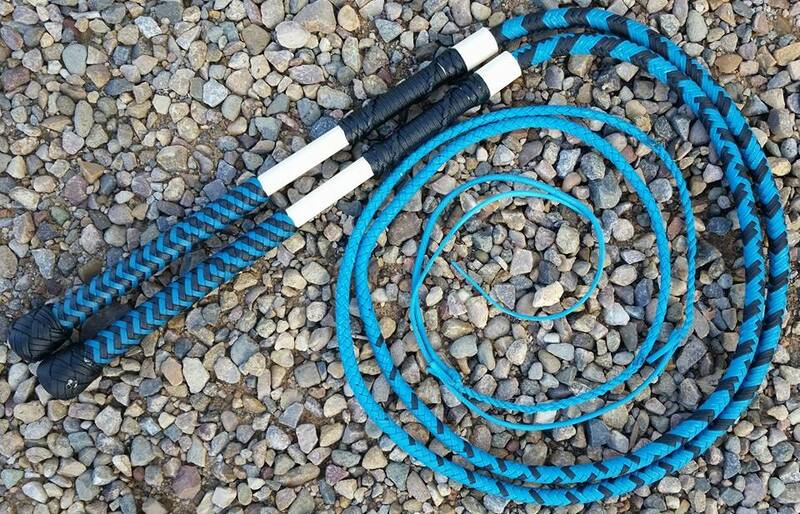 A good whip , is almiost like a whip within a whip within a whip .. that’s why they cost hundreds of £’s. the skill and labour costs and the makers desrve every penny. They can be red hide, kip, green or white hide depending on the tanning process , the leather is much thicker than roo hide, but they can all still makes great whips . 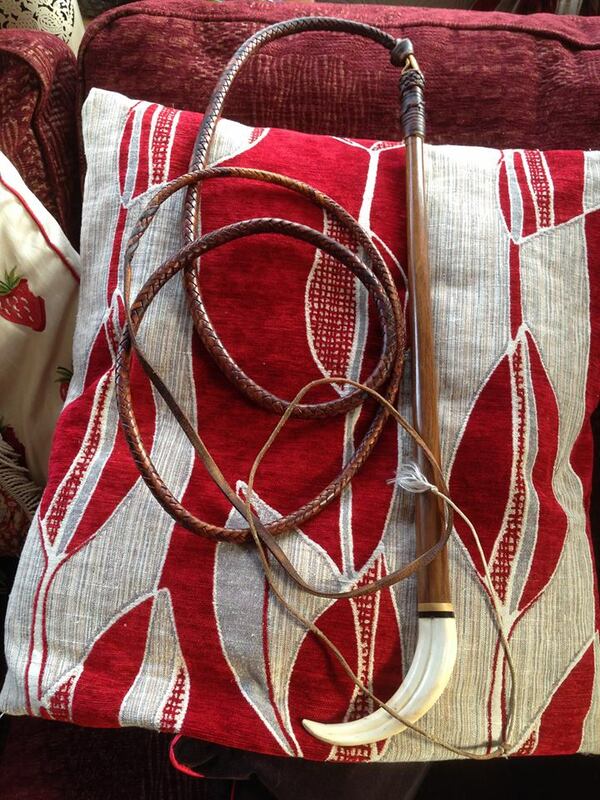 I have a series of 4 plait red cow hide stock whips that are indestructible but a bit heavy for some people. 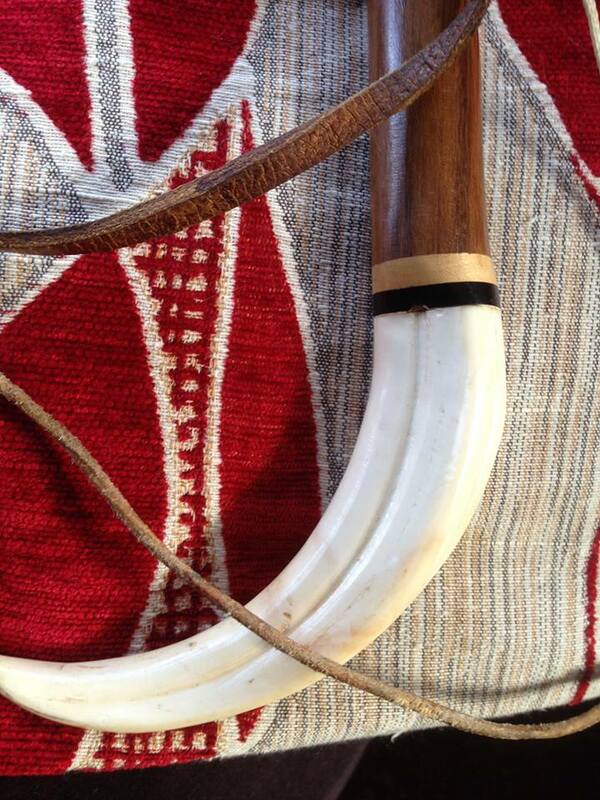 Also kudu a type of gazelle leather from SouthAfrica is used , very tough stuff. Traditionally made with certified military grade parachute cord with the inner strands removed, today tho a number of overseas cord makers are on the bandwagon and the quality of the cord can be indifferent, you also come across Dacron or polyester cord being used which can give a very smooth action but doesn't appear to wear as well as the military grade. 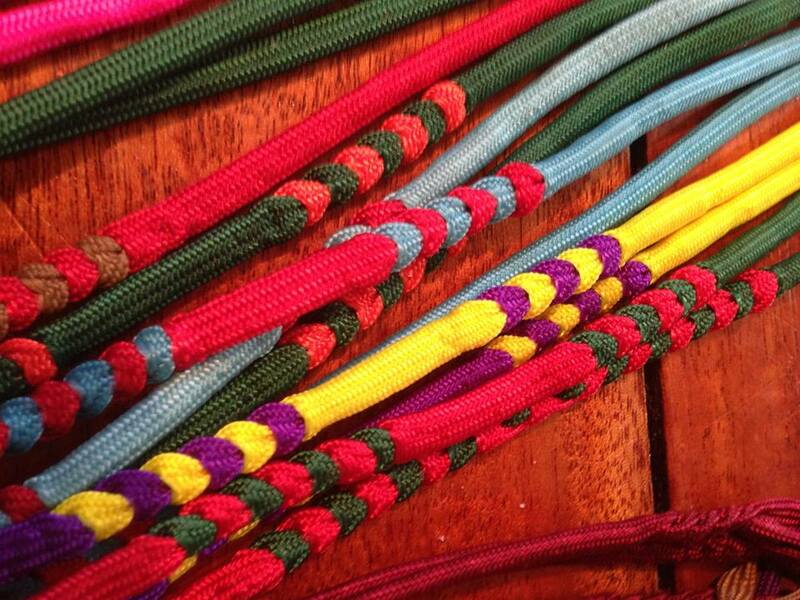 You can get extraordinary colour choices including flouro and flourescent in paracord. How can I tell if it's nylon or polyester? A quick test is to try and melt the end of a piece of cord, if it melts cleanly into a smooth golden globule it's nylon , if it doesn't melt very well it might be polyester. 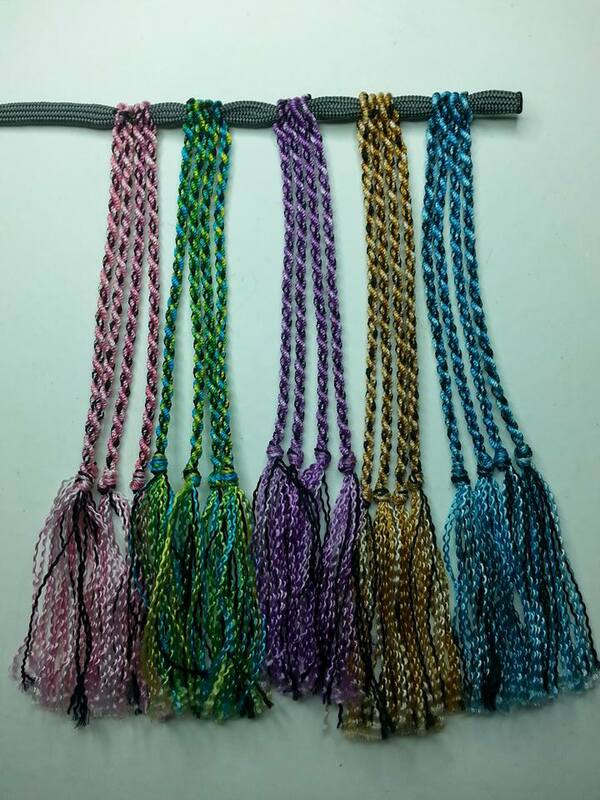 A lot of the very popular PH style whips are 12 braided strands of paracord covering a core of bundled paracord , relatively cheap, light and fast, they work well and some of my heavily used ones are 10 years old and more . 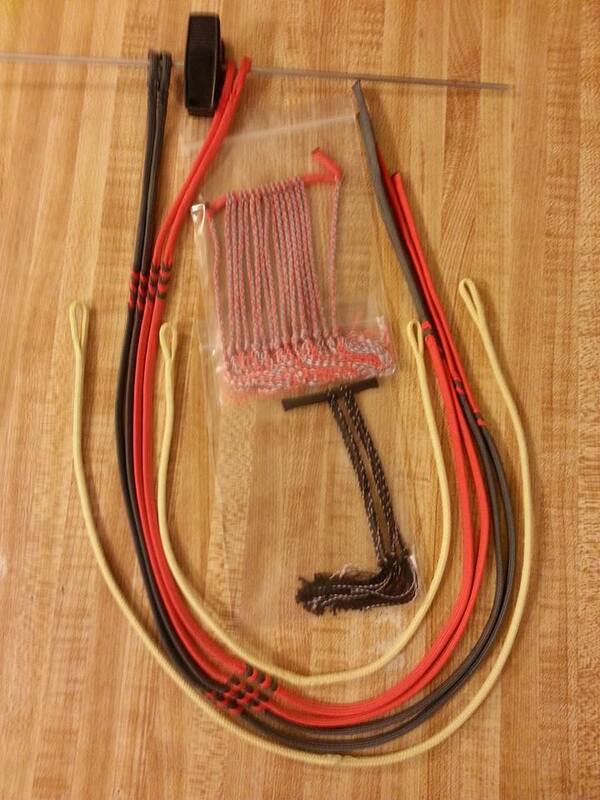 More expensive whips will have a paracord core that may be weighted with small bb lead weights and then braided with 8 strands , then over braided up to twice more with 12 then 16 strands of paracord , obviously they will be a heavier whip so worth handling one beforehand to ensure you can handle them for any quick routines you have in mind, their weight can lead to easier cracking for side cracks but you might struggle to do much else with them. Try before you buy! 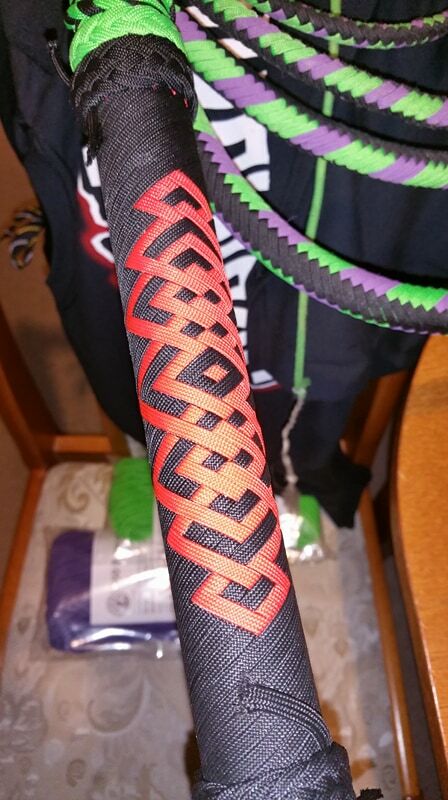 Worth doing is bending the braid well, to see if you can see the core easily inbetween the braiding it may not last very long, a well made whip might have another layer of braid underneath but if the top cover is tightly braided you'd be hard pressed to see it . I've had whips with a rope and paper core that had just been braided over and whips so lightly braided the core of bundled strands of para cord could be clearly seen.. not clever. Sometimes makers "wax" their whips , that is they are dipped into molten parafin or soya wax then left to drain and cool , this fills in gaps in the core and gives it a heavier feel, some say it helps the whip and some say nay. try them all and make your own mind up. 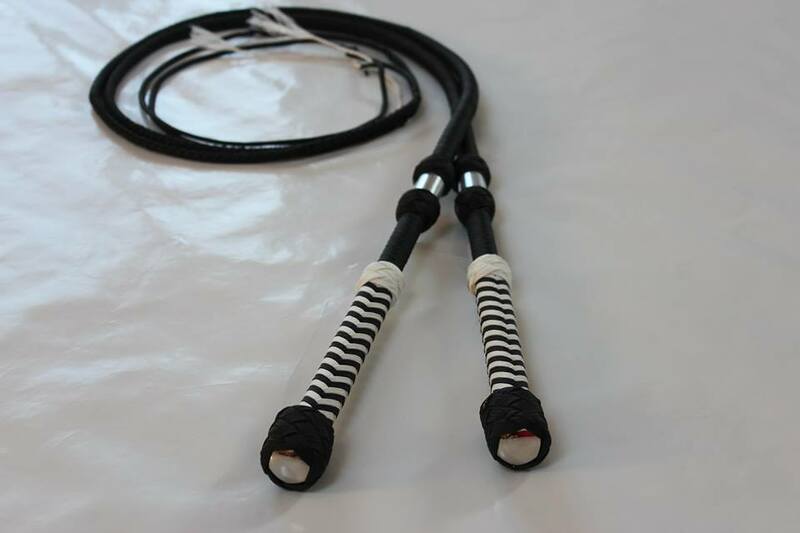 Some people deride the use of adhesive electrical tape in holding the core together when you are making a nylon whip and say no tape ought to be used but some well known makers who make great whips use that method. I'm led to understand that if the whip is then dipped in wax the tape will get loose and make the whip "lumpy" . I've not had that problem yet with nylon whips but have had it with high end kangaroo whips that I know don't use tape so I don't know the answer to that one. If you know what you are doing and it doesn't crack easily put it back! if it's as stiff as a stiff thing , don't touch it ! 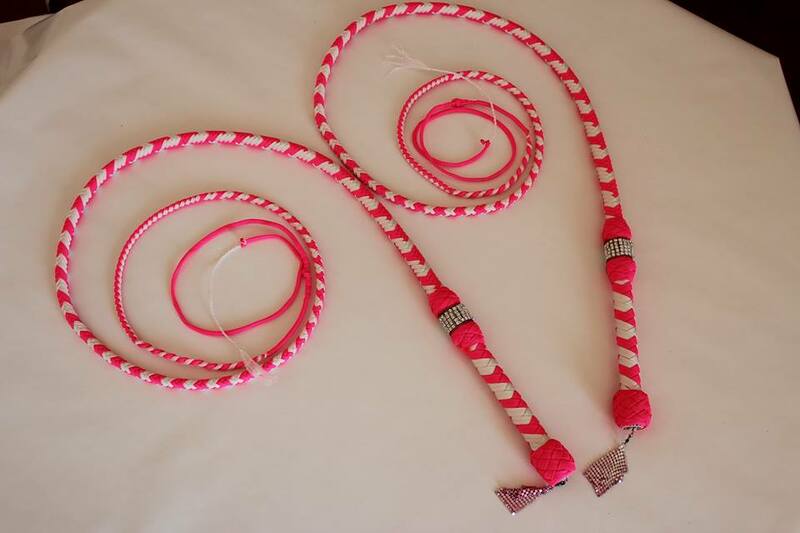 Pretty well all whips have a "set" i.e. it will naturally want to bend more one way than another but it shouldn't be so pronounced that it effects the way the whip "rolls out" when you throw it. This is where buying from experienced and known makers is the best bet, see the list below. 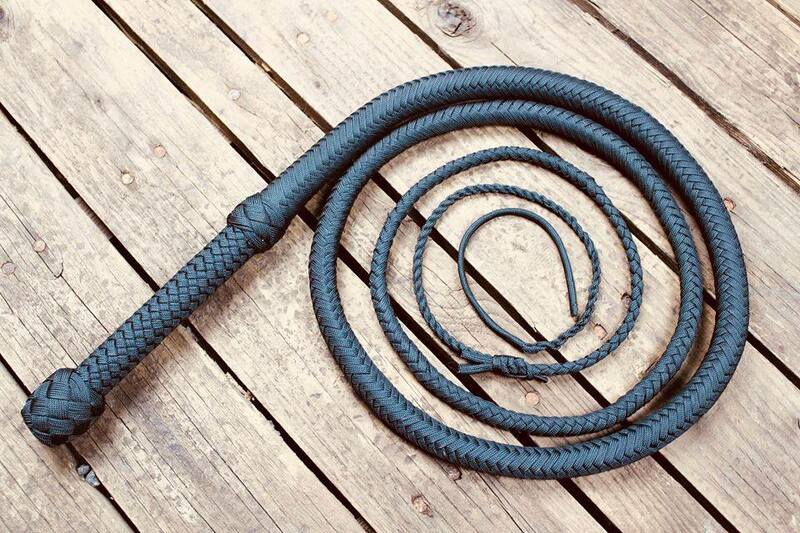 There are many whip makers now around the world, whereas it might not be possible to try them all, here are some makers that I have had good whips off in the past and those whose good reputation is known worldwide. After years of encouraging people to take up this grand sport, young people are its future, I therefore avoid any whip maker who is not family friendly. How much will they cost ? A professional whip maker may take three days to a week make a 8 foot roo whip, (cutting the strands, sizing them, tapering them etc etc etc), good kangaroo hide is very expensive so think about the wages for a week for a skilled professional craftsman , add the cost of the product, rent and rates of the shop, heat light pension and insurance and some profit then don't be surprised to pay several hundred pounds for a quality leather whip. Will I have to pay up front while they make me one? Generally Yes , and ask how long you will have to wait , I once waited two years for a whip from a world renowned maker and three is normal. Don't forget to add post, packing and shipping plus Customs Duty if you are ordering from abroad! It used to be (when the Exchange rate was more favourable) that basically a $150 dollar whip from the States would cost you £150 by the time you had paid, Customs handling charges , VAT etc. What if I only have a tiny budget to buy a whip? You can borrow a whip, for the cost of postage, see details below or you can make your own Adam Winrich Instant whip! 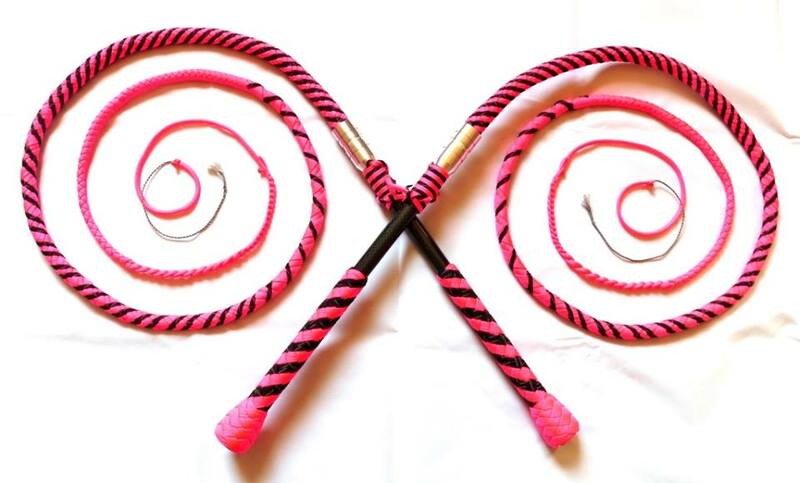 Also known as the Fifteen Minute Whip ( more like fifty the first time to be fair) The prototypes were made in my home and I still have it and use it regularly. Contact me for the instructions and contents list with suppliers, the material cost is about £15 - 20. as of 2018 .See how they are made here. I wasted £££££ buying rubbish whips when I started and now I'm fortunate to have a couple of whips that don't get the use they deserve so I'd rather they be used and encourage people to take up this great sport, I have also have soem sample whps from makers for you to use in workshops. All you need to do is read the bumf below and join our Sport, Circus and Performance Group on Facebook, we have over 880 members from around the world, apply, Friend me and I'll send the conditions for this family friendly group and we can go from there. 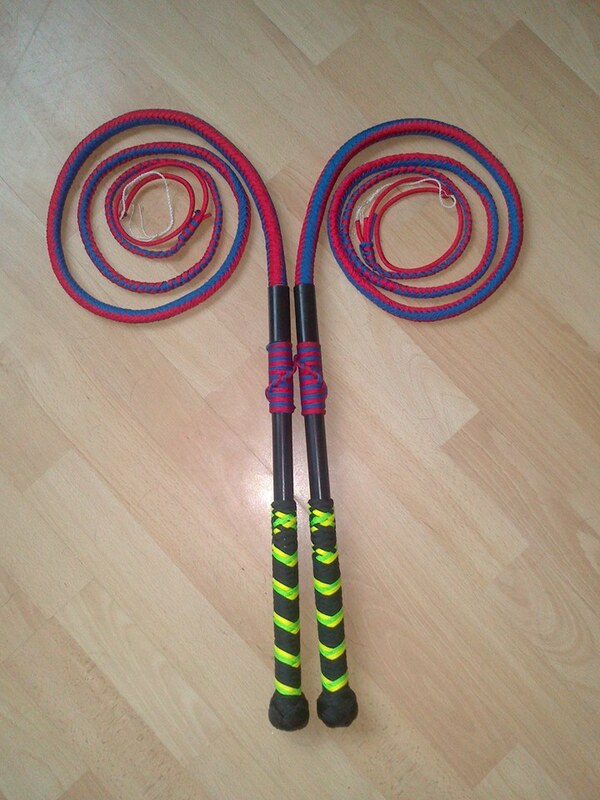 I've wasted hundreds of £s on whips that that they were either rubbish or didn't suit me. 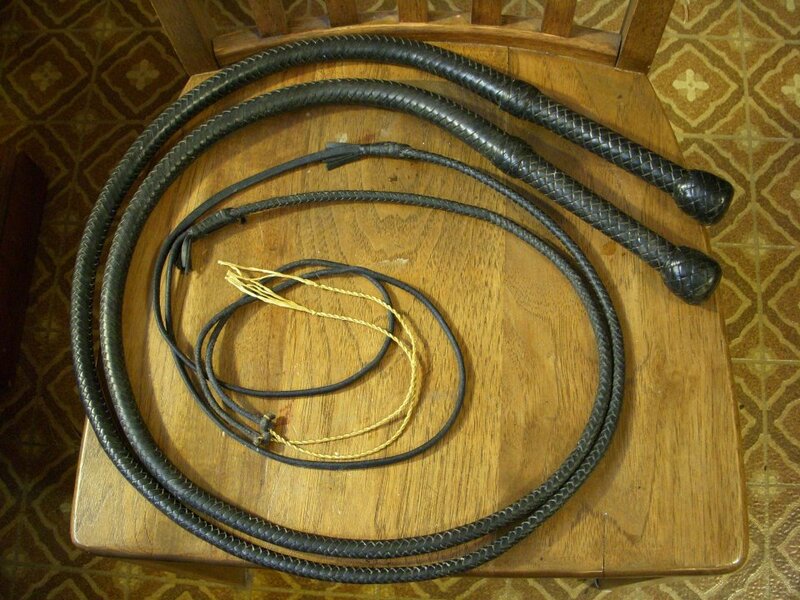 To save newcomers to the sport that trouble and expense and let you try some whips before you buy I came up with the Loaner Whip Package. The whips are all used but would cost several hundreds of £s to replace so please treat them like they were your own and follow these rules . 3 Find a place where you can practice that will not alarm the public or frighten dogs or children. 4 Do not crack whips on gravel or tarmac, it wears them out badly and can send shrapnel at the speed of sound towards innocent bystanders. 6 Keep an eye on the state of the fall ( the long thin bit at the end ) because if knots appear in it ( and they will ) they can be difficult to remove if left in place and they weaken the fall. 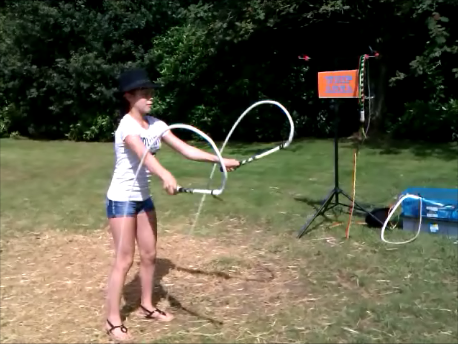 There are video links on my website on how to crack whips and how to make crackers and how to replace them. See the Whip Resource Page at www.ahandfulofhats.co.uk. I will not be held responsible for any harm or damage caused by or to you using these whips, I retain ownership of them at all times. As every whip cracker knows, 'ouch' is the sound of learning! But follow these simple guidelines, and you should prevent a minor mishap from becoming a major injury. 1. Wear earplugs, especially if you are working indoors. 2. Wear sensible clothing. Flat soled shoes or trainers, a long sleeved top, jumper or shirt and thick loose trousers offer the best protection. Leather trousers and a leather jacket is a bit OTT but can look kind of good.. Jeans are ok, but tight fitting clothing offers little protection as the energy of the impact goes straight through. Wear a broad brimmed hat to help protect your ears. For new manoeuvers with long whips, some people even wear crash helmets. 3. Protect those around you as carefully as you protect yourself. Remember that if you are practicing target work with an assistant, they are much closer to the crack than you. You might think ear protection unnecessary, but they could well disagree! leather gloves or similar are good if they are holding targets. Give yourself space to the sides and above. 4. Avoid working where there is loose debris on the ground. Gravel and loose earth canbe picked up and thrown at great speed and cause injury; and will damage your whip. 5. Stay aware of what's going on around you. Dogs can be attracted to the sound, as can children, and they always seem to approach from behind! Ideally, have someone 'spotting' for you to prevent other people from being hit if they get too close. 6. If you are practicing with other people, establish a 'working area' in which safety glasses must be worn at all times..
7. Get good at the basics before moving on. 8. Whips can be dangerous, do not fool around with them. Whip crackers and jugglers are always welcome to my indoor rehearsal space or my favourite park in the summer here in sunny Barrybados, I also offer structured lessons for beginners and performers in whips, knife throwing and performance skills. The "More Danger" Club is open every Wednesday afternoon during the Winter and Spring , come and join us at little or no cost. Who to buy a Whip FROM? there are a number of UK and overseas suppliers who sell rubbish, don't be conned. But if you see one you really really like, send the link to me and I'll check it out for you. Makers are not in any order of preference nor can I vouch for any product or remedy any fault. but I have bought great whips off most of these makers in the past. UK makers first, Facebook or website links you may need to copy and paste them into the Address bar of your search engine. 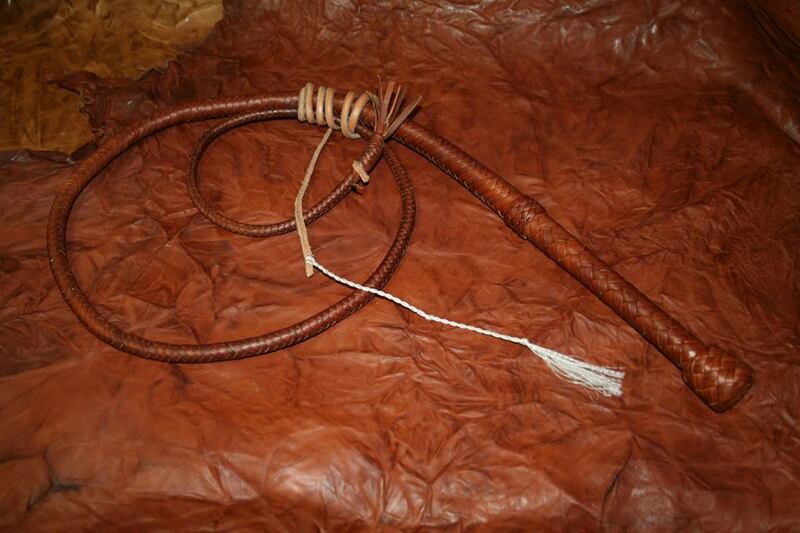 Traditionally all whips have a core , on a quality kangaroo leather whip it may be a long tapered piece of red hide cow leather or roo hide, then covered in a sheet of roo hide which is then then plaited over the top with thin strands of leather, this is what they call “a belly” it can be covered again with a sheet of leather called a bolster and then a final braid of leather strips over the top of that or the bolster could be replaced with another braided cover , that would give you a “two belly” whip as the “core” is never counted as a a “belly” On a nylon whips the “core” is often a bundle of paracord which is braided over the top, some of my best performing whips are built this way as they are light and flow well. 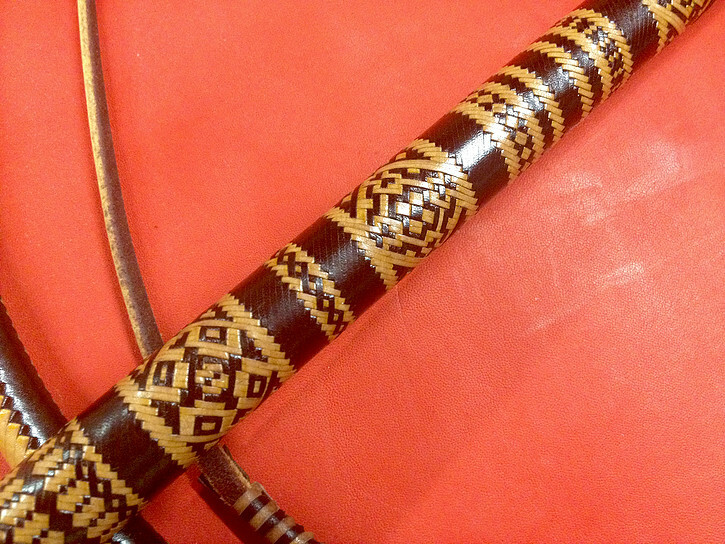 some makers may braid over the top of the core and then braid another final layer over that as well, this is a “two belly” whip, they tend to be heavier. A design engineer and Swiss watch repair technician who has used his knowledge of materials to up the game on whip design, mixing custom made carbon fibre handles and intricate paracord plaiting patterns with the option of laser engraved aerospace grade aluminium couplings and heel knobs. 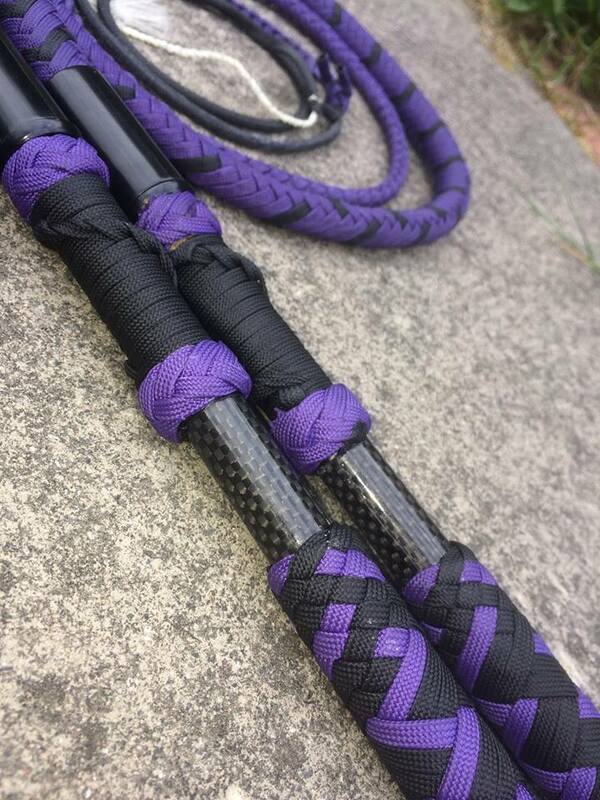 He specialises in carbon fibre handled bullwhips and is now producing a very nice range of lightweight stock whips that make perfect beginners whips. A Welsh whip maker who has supported Circus whip cracking for some years, his clients include myself and other international circus performers . He offers, Bull, Cow , Stock and PH style nylon whips. Contact for prices. 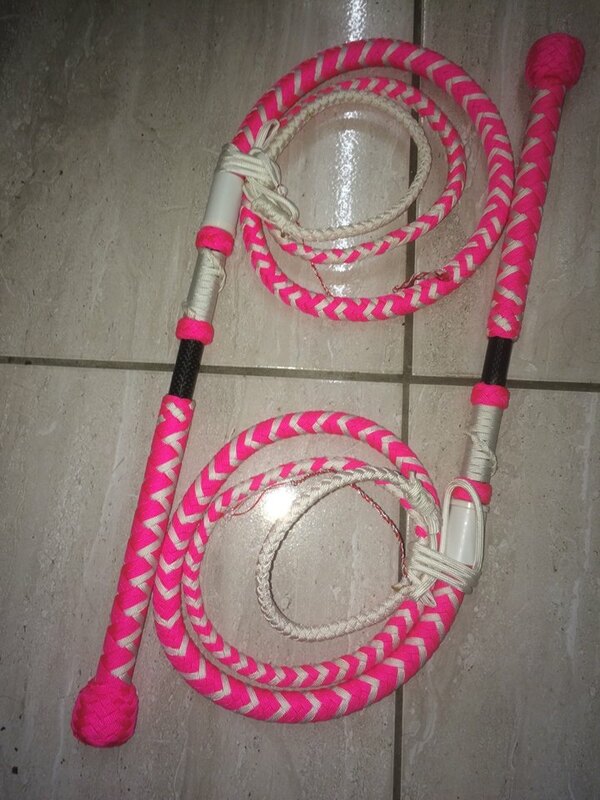 Talented performer and knife thrower is now making budget beginners whips thanks to help from Ian Savin , they are tough and work well at a great price, I have some you can try if you are not near Milton Keynes. 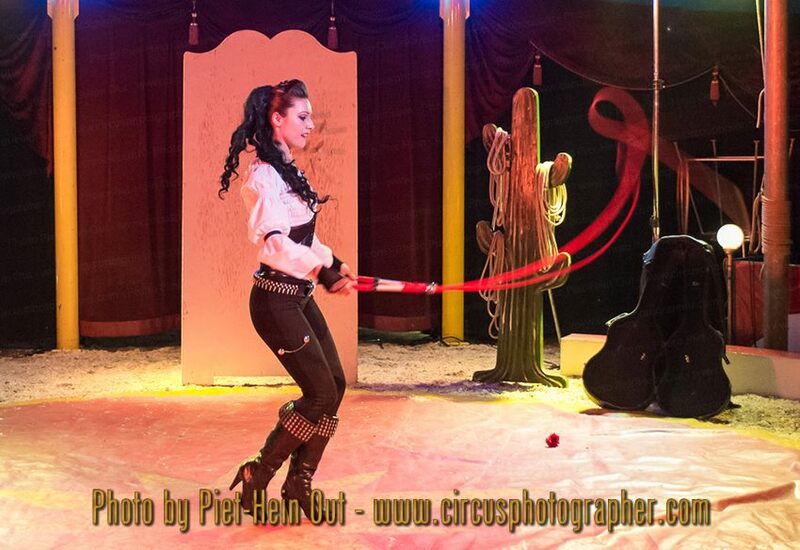 Circus performer and tutor. 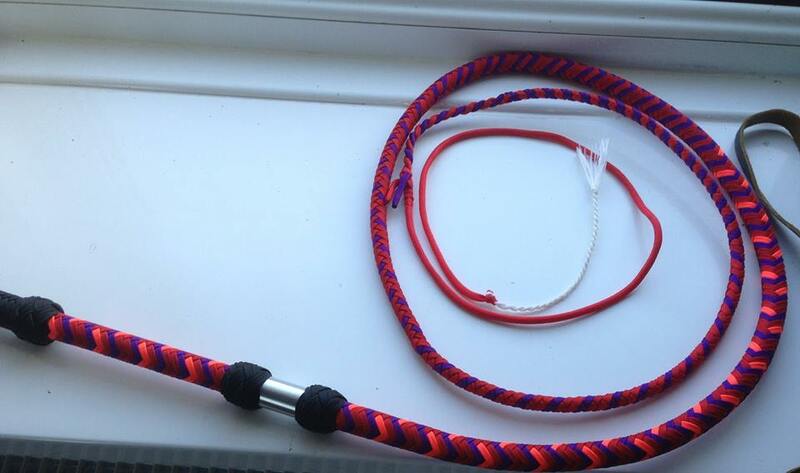 Another Welsh whip maker who is now selling nylon whips that work very nicely, Contact Andy for prices. 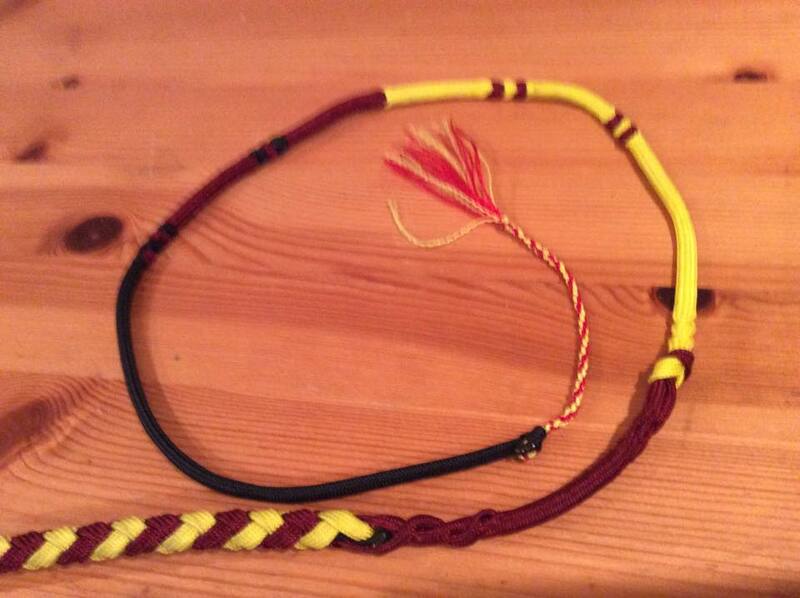 He now appears to specialise in heavier weight nylon bull whips with options for intricate pattern braiding. I have a couple of his early shorter nylon bullwhips and they work extremely well. Contact Ian for prices. A charming man from Germany who has helped countless new whip makers learn the trade , a talented leather workers and he smokes a mean sausage too. 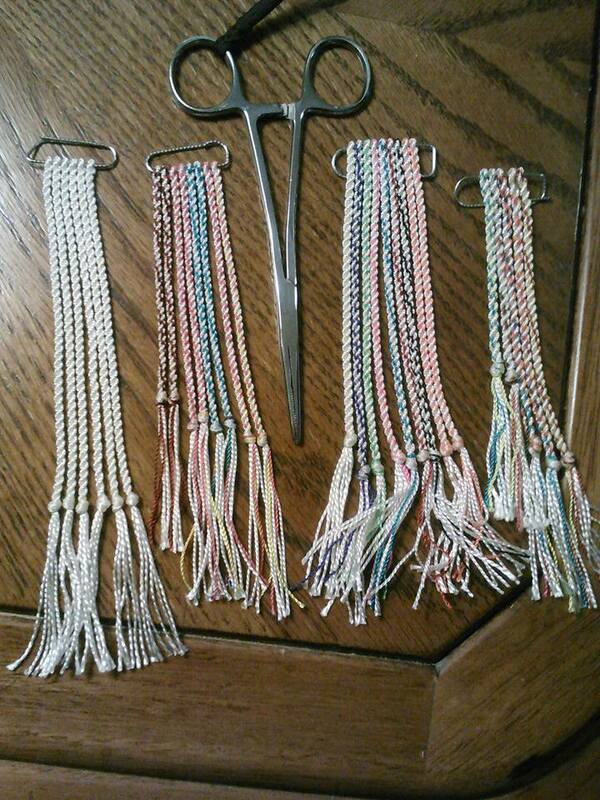 His nylon whips are known for their accuracy and I love the flow of the ones he makes without the steel wire core . Contact Axel via Facebook. A charming French doctor who makes and teaches how to make quality whips in nylon or leather, vertually every whip cracker I know in France has several of his whips :-) I have a number of his long leather bull whips and wish I had more. Contact me for his email address. 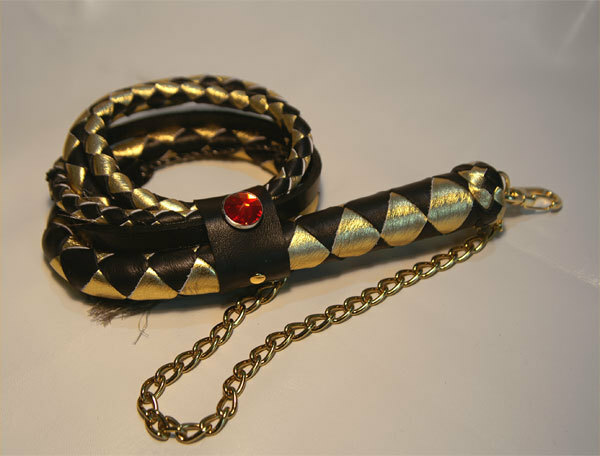 Veryu talented guy from Belgrade who makes quality leather whips. I’ve had one of his Cossack whips, very nicely made. 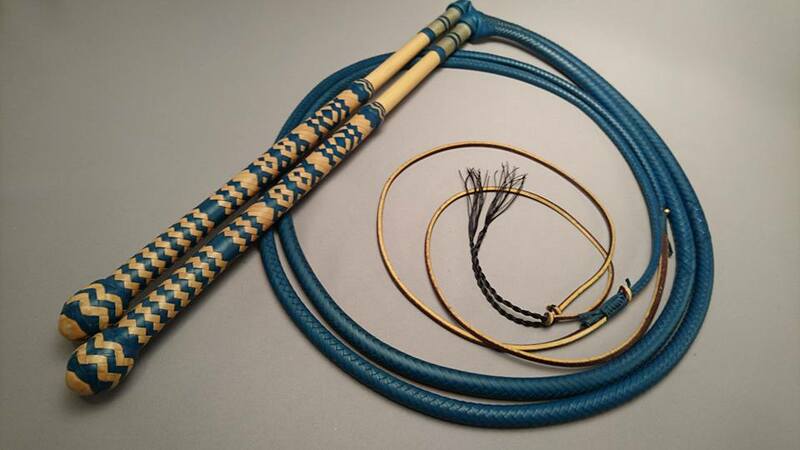 From Bulgaria Lyu Ben makes fine quality leather and nylon whips that perform faultlessly. 20 years ago I bought whips off this Montana cowboy and they still work brilliantly, he still makes exceptional good and tough whips that are designed to be used on or off horseback. A Floridian native living in Georgia , he keeps alive the Florida Cowboy traditional cow whip with rare wood handles if required and fine braiding in all his work. 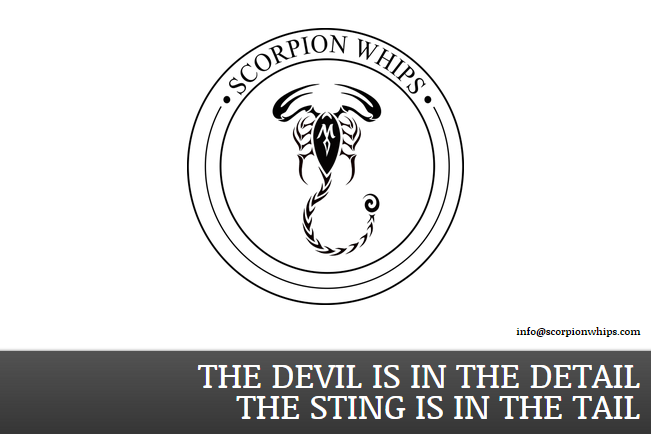 The cow whip with its "socket" connection to the handle shows the origins on the PH whip, his whips are legendary. He recently became a LEO but will still find time to make you an exceptional whip if you ask nicely. 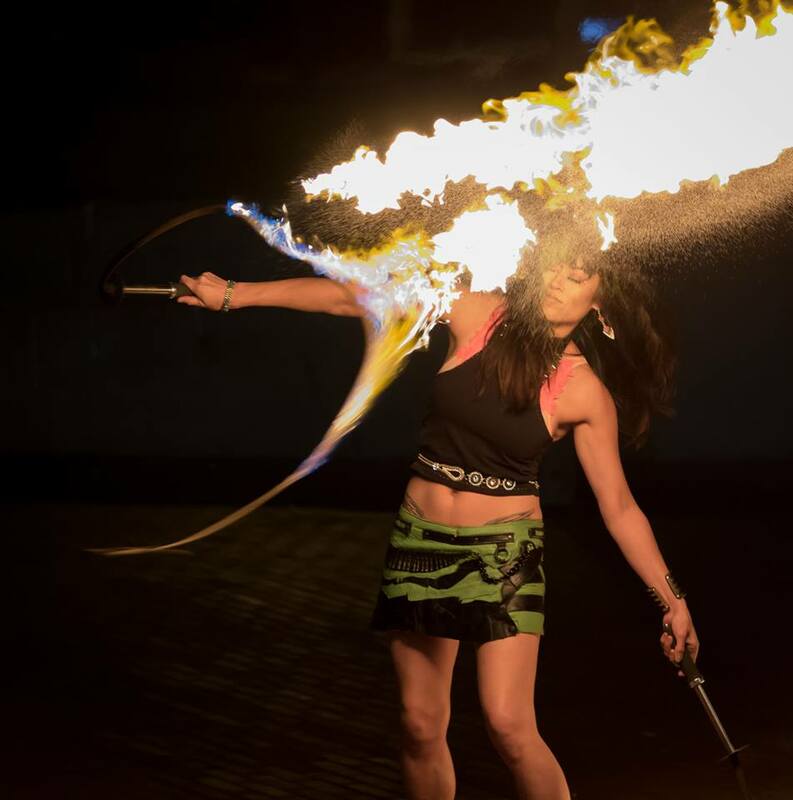 Talented circus perfomer and exceptional whip cracker , she performs with her husband Adam Winrich and makes PH style whips at great prices and with an increasingly good reputation . They flow like silk. I have a long handled bullwhip and two short PH style whips which are sunning themselves in Hawaii... funny old game, this whip cracking malarkey ..
, High quality Leather and Nylon whips to order, his Whippa lace stock whips are legendary, as designed by Gary Brophy and are used by Adam Winrich, Gary and Todd Rexx , all legends in whip cracking. I've used stock whips from Simon and the owner had to fight me to get them back. Now moved to LA , very skilled maker and whip handler , lovely lovely whips , the go to guy for the film industry. Gerhardt is a voluntary game reserve warden and has been instrumental alongside Margaret van Dyk in populising Sports Whip Cracking in South Africa . They organise regular meets and competitions. 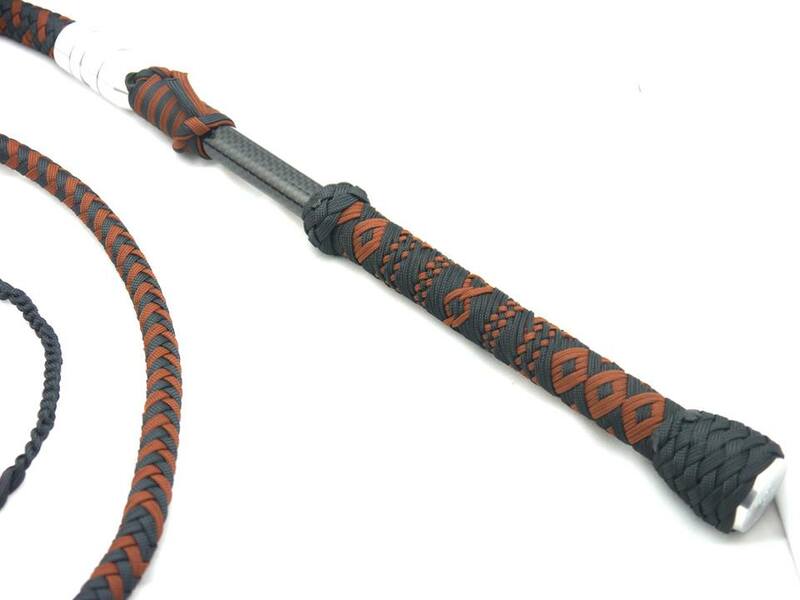 Gerhardt makes a variety of whips and leather goods including fantastic simple stock whips that are a joy to use, just check the the cost of postage from SA. Carriage driver and whip maker who uses kudu hide amonst other leather , very interesting integrated fall knots that ae more like intertwines but still appear very tough. I have two of his whips here in the UK and both crack very well. 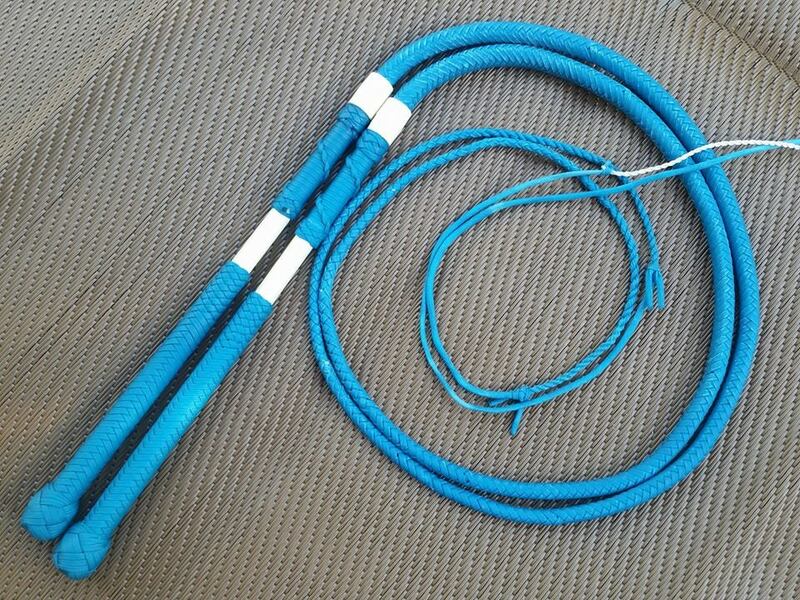 Two things you need to be able to do once you have learned how to crack a whip. 1 How to make a replacement cracker to go on the end. 2 How to attach a cracker to the fall of a whip. 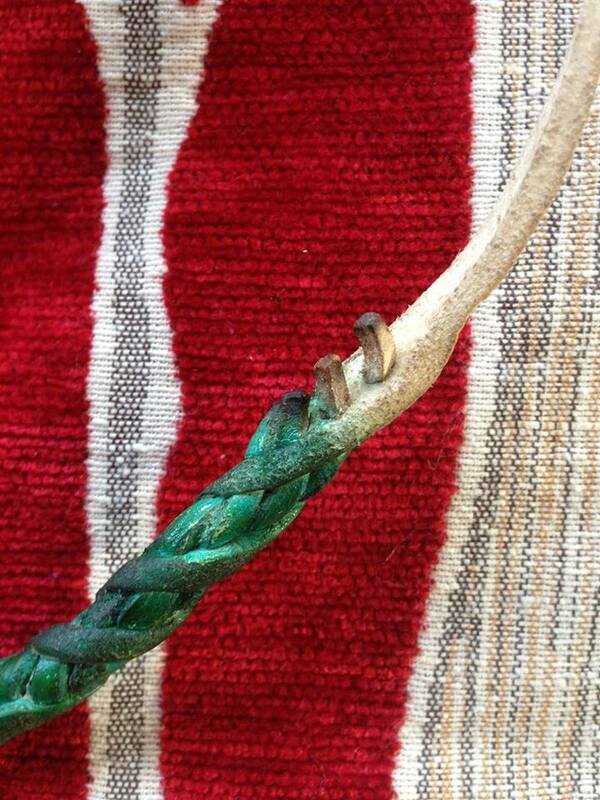 How to repair the twisted fall on a nylon whip. Need a replacement fall or want some posh crackers? How to crack a whip . There are many great YouTube videos, I've compiled a list of basic cracks and accompanying videos that I hope you will find useful. For further help and info please join our family friendly Sports Whip Cracking Group on Facebook and get in touch with me for trainers near you. Group and one on one lesson are the finest way of learning whip cracking but if you are unable to meet up with other fans, then this how an awful lot of us learnt! . For the beginner and advanced practioners the ubiquitous YouTube has a wealth of material that can help and inspire you and of course, also put you off for life when you see how far you have yet to go :-) But persevere padawan, we will always continue to learn and improve, there are no true masters only students. Safety, Safety, safety , when learning, please wear safety glasses. Be warned you will hit yourself!!! It HURTS!!!! A wide brimmed hat with long sleeved shirt and jeans are always a GOOD IDEA and leather gloves are sometimes an even better idea. Ow! may be the sign of learning in whip cracking but if you are continually hitting yourself something is badly wrong , get in touch and ask for help! Names of the different cracks . There are regional variations on the naming of cracks ! The Circus Crack, The Cattleman's Crack and The Forward Crack , The Gypsy Crack, , The Lion tamers Crack are all the same thing!! I've seen The Flick called the Side Arm Crack the Underhand Crack and the Side Crack! confused ? don't be , watch the videos, see how it is done, if someone calls it something else..... fine ..... the only important thing is when you enter a competition is to call it what the judges recognise , when you get to that stage I have a copy of the Australian Championships rules for reference. 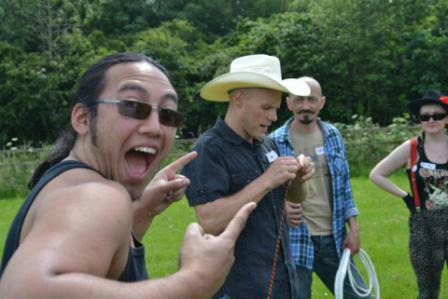 From left to right Peter and Sylvia Rosat, teaching Swansea Burlesquers, Adam Winrich and Peter at the 2012 UK National Convention, Whip cracking workshops at the Southend BJC 2013 , workshop at National Museum of Wales , Simon Ratzker getting excited , Pete and Adam doing a double act , traditional whip crackers farewell !